Made in China, this bowl with lid displays an underwater scene with an overall light blue color on the outside of the bowl along with dark blue reefs, bubbles, and fishes swimming around. With a smooth a glossy finish, this blue and white bowl with lid is perfect for taking to work or school for lunchtime. Bring dinners leftovers in this personal size bowl or even make instant ramen in them too. 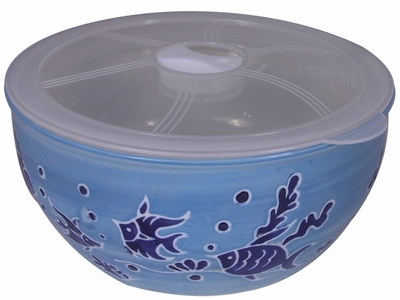 With an airtight plastic lid, you can easily prepare instant ramen in this ceramic bowl. The plastic lid also has a vent, which can be opened and closed too. Dishwasher and microwave safe.